Moments after winning the night's top honor, Chadwick Boseman expounded on his definition of the song "To Be Young, Gifted and Black" backstage after "Black Panther" won the show's top award. PHILADELPHIA (AP) — Philadelphia police say they were startled to spot a bullet-ridden New York City police cruiser with a broken windshield on a city expressway early Thanksgiving morning. Police say they tried to stop the car only to have the driver flee. They say the cruiser was later found abandoned and proved to be a stolen prop from a movie being shot in Philadelphia. 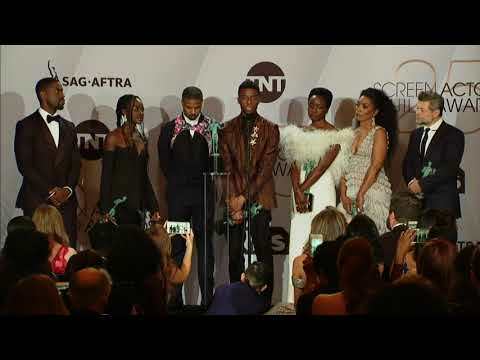 Movie of the year: "Black Panther"
Actor in a Movie: Chadwick Boseman, "Black Panther"
Actor in a Show: Millie Bobby Brown, "Stranger Things"
Kiss: Keiynan Lonsdale and Nick Robinson in "Love, Simon"
LOS ANGELES (AP) — "Black Panther" will get its first shot at some awards show love as the top nominee at next month's MTV Movie & TV Awards . The global smash hit garnered seven nominations including for stars Chadwick Boseman, Letitia Wright and Michael B. Jordan. The second leading nominee is Netflix's series "Stranger Things," which received six nominations including for best show. Kevin Feige says 'Black Panther 2' will happen when director Ryan Coogler gives it the green light. The President of Marvel Studios has revealed he would love for Ryan to return to direct the project, but he admitted that the studio's timescale will be dictated to by the 31-year-old filmmaker. Speaking to Collider, Feige shared: "We definitely want Ryan to come back and that's actively being worked out right now. WASHINGTON (AP) — The "Black Panther" is returning to his alma mater to give the commencement address at Howard University. 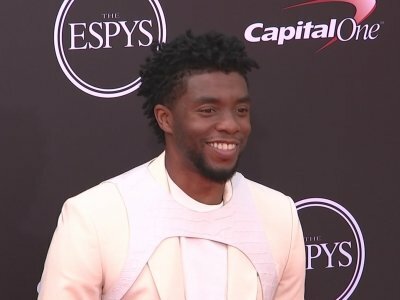 The university announced Wednesday that Chadwick Boseman will give the keynote address at Howard's 150th commencement ceremony on May 12. News outlets report Boseman will be presented with an honorary Doctor of Humane Letters, the university's highest honor. 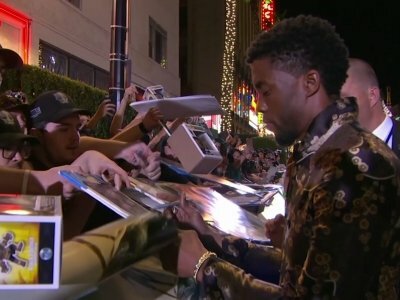 It has been an awesome year thus far for Chadwick Boseman, the accomplished actor now starring in the global box office blockbuster, “Black Panther.” In addition to his cinematic success and all that goes with it, Boseman will make his debut as the host of “Saturday Night Live” (“SNL”), airing April 7 at 11:30 p.m. on NBC. Boseman’s musical guest will be multi-platinum rapper Cardi B, who also makes her “SNL” debut. LOS ANGELES (AP) — Cardi B isn't just going to sing during her upcoming appearance on "The Tonight Show" — she'll also be asking questions. CLEVELAND, Ohio -- You don't have to wait for the "Black Panther" sequel to go back to Wakanda. The Avengers are taking their fight to save humanity to the land of Vibranium. It’s great to have a superhero film that doesn’t look like every other superhero film. There’s no Iron Man lurking, no Loki in the wings. There’s not even a strong tie to The Avengers saga. What there is in "Black Panther" is a crackling good story in a new world that’s grappling with problems not unlike those we face in the United States today. This, thanks to director Ryan Coogler, is the allegory “Avatar” should have been. I went into "Black Panther," directed by Ryan Coogler ("Creed," "Fruitvale Station"), with preconceived notions that I was not going to be thrilled by it. Having seen the underwhelming trailers, coupled with the sorrowful attempt on the small screen to rush a generic equivalent ("Black Lightning") ahead of this movie, I was amazed at the film's Rotten Tomatoes rating on the opening weekend. Imagine going to see a Marvel superhero movie where all of the characters not only look similar to you, but where a story is about the often negatively highlighted continent from where your ancestors arose. Marvel Studio's "Black Panther" does and achieves exactly that — and so much more. A weekly get-together levels up when the couples participate in a murder-mystery party. With Jason Bateman, Rachel McAdams, Billy Magnussen, Sharon Horgan, Kyle Chandler. Written by Mark Perez. Directed by John Francis Daley & Jonathan Goldstein. Marvel Studios and Ryan Coogler's blockbuster superhero movie "Black Panther" has become a legitimate global juggernaut, grossing a jaw-dropping $427 million in global ticket sales and defying movie business assumptions. It's also showing strength in the continent where the film mostly takes place _ Africa. Not since Alex Haley's 1976 book and miniseries "Roots," whose painful and powerful depiction of slavery forced a cultural reawakening among African-Americans, have we seen a phenomenon like the superhero film "Black Panther." Think about it. The Marvel epic, released last weekend with an almost all-black cast and directed by Ryan Coogler, an African-American, raked in $400 million in just four days and turned some movie theaters around the nation into scenes of cultural displays. 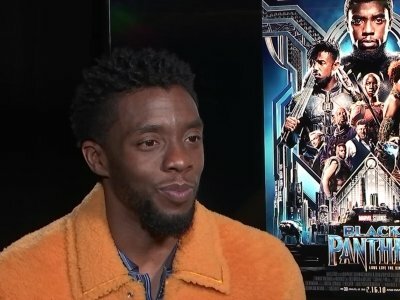 Chadwick Boseman says there's more excitement surrounding 'Black Panther' than the release of the Malcolm X biopic. The 41-year-old actor - who plays the titular character in the new Marvel movie - believes that the film, which centres on a superhero of African descent, has created more of a buzz than the Spike Lee-directed 'Malcolm X', which saw Denzel Washington play the civil rights activist. NEW YORK (AP) — With a massive $40.2 million in ticket sales Monday, "Black Panther" has set another box-office record: biggest Monday ever. The Walt Disney Co. again raised its box-office estimates for the Marvel sensation on Tuesday. The film's updated Monday performance — $7 million higher than Disney earlier forecast — narrowly topped the previous record, set by "Star Wars: The Force Awakens" in 2015 with $40.1 million. ALBUQUERQUE, N.M. (AP) — For years, Zavier Thompson has followed Marvel superhero movies. But the 16-year-old student in Albuquerque has always wanted to see a popular film with a black superhero and black themes. Thanks to an Albuquerque educator, the aspiring hip-hop and spoken word artist finally got his wish Thursday when he was given tickets to a private screening of "Black Panther." BEVERLY HILLS, Calif. (AP) — Letitia Wright still can't believe she made the "Black Panther" poster. NEW YORK (AP) — "Black Panther" is so far raking it in over the holiday weekend. The Walt Disney Co. estimated Saturday the Marvel Comics superhero movie earned $75.8 million domestically for its opening Friday, the eighth biggest day in industry history. Disney now estimates the movie will earn between $190 million and $210 million for the four-day Presidents Day weekend that started Thursday. For months, there has been speculation and anticipation over “Black Panther,” director Ryan Coogler’s epic interpretation of the Marvel Comic by Stan Lee and Jack Kirby, about a Black super hero. Now that the film is finally in theaters, I’m happy to report that it has absolutely lived up to the hype. marrying naturalistic character development with spectacle muscle. "Tell them who you are" is the encouragement shouted at the title character, T'Challa (Chadwick Boseman), prince of the African nation Wakanda. But it could just as well serve as the overarching rally cry of a film that for many symbolizes a big-screen affirmation of African-American identity. "Black Panther" stands for everything that's been missing from Marvel's — and Hollywood's — universe. NEW YORK (AP) — No one is more at the epicenter of the watershed pop-culture moment that is "Black Panther" than Chadwick Boseman, the Panther himself. While much of the film industry is still catching up to the call for more diversity, superhero-supersaturated comic book blockbusters are broadening their reach. Black Panther Marvel Studios first feature with a black hero in the lead flips the script on Hollywoods racial status quo, where people of color are kept to the margins or rendered invisible. There are other movies opening this week besides "Black Panther." Take a look. Chadwick Boseman’s Avengers character gets his origin story that takes place in his African kingdom of Wakanda. A great cast, director Ryan Coogler (“Creed”) and a soundtrack curated by Kendrick Lamar has many people excited. CLEVELAND, Ohio -- The first blockbuster of the year arrives in theaters today. Marvel's "Black Panther" is poised to dominate the box office over President Day's weekend with a predicted gross between $180-$200 million according to Deadline. In case the movie is sold out, you can always watch one of the other two new wide releases: the stop-motion animated pic "Early Man" and the biblical action film "Samson."